There are more than 235,000 jeepneys in the Philippines and very few elsewhere. 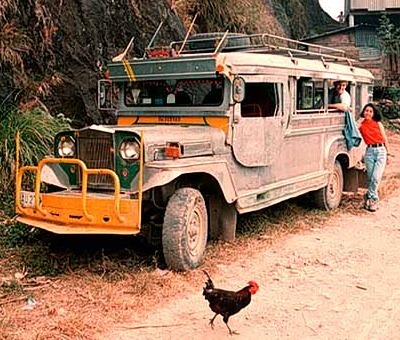 The jeepney (from the words jeep and jitney) originated after World War II, when Filipinos modified abandoned U.S. jeeps for use as small buses. They extended the bodies up to four times the original length, added steel roofs, installed benchseats along the sides of the interior, and opened up the backs. The design can easily carry up to 11 passengers. Drivers often mounted chrome horses on the hood in remembrance of the horsedrawn carriages that once performed the same function. No two jeepneys look alike; owners decorate their vehicles with fancy mirrors, lights, paintings, numerous whip antennas, and shiny metallic exteriors. Jeepneys still resemble jeeps, at least from the front, but no longer contain any jeep parts; instead, they are handcrafted from parts taken primarily from junked trucks, and cost less than $6000. 25 Aŭgusto 2004 modifita, de Ailanto verkita.